Satana: Get me clear of Mephisto, and I'll help you send him back to Hell. Moon Knight: How do I know you won't eat my soul? Satana: You smell resurrected. I don't do leftovers. Satana: Thanks, Drac. You're like the dusty, blood-drinking dad I never had. Dracula: I don't want to fight you, Satana. I only care about saving my people. Satana: You have a good heart. Don't make me have to rip it out of your chest. 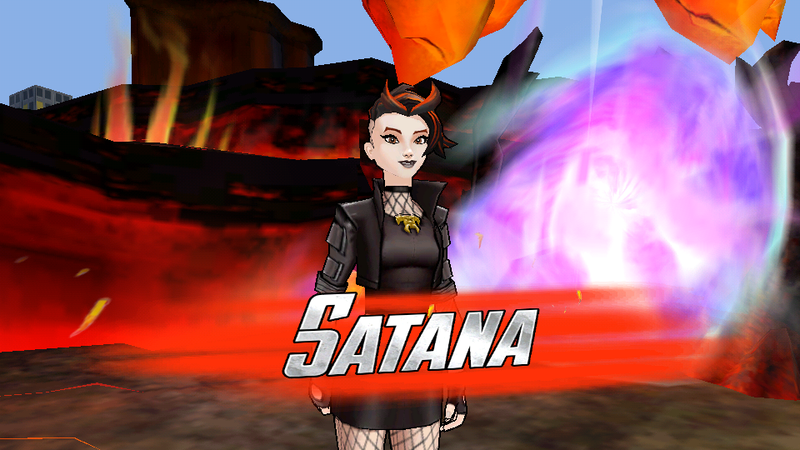 Satana: Are you sure that Avengers Academy is ready for Satana? Nick Fury: No, but I'm pretty sure we need your help to get rid of Mephisto. Nick Fury: That's what they all say. 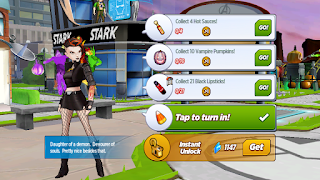 Pepper Potts: Welcome to Avengers Academy, Satana! Let me know if I can get you anything! Satana: I'll need a list of things you don't mind me setting on fire, and a list of students who wouldn't mind having their souls devoured. Pepper Potts: Those are both part of the standard orientation packet. Satana: I'll need to work with my Hellfire powers before battling Mephisto. Satana: Is your hand possessed? Iron Man: Is it hot in here or is it just Hellfire? Satana: Did you really think it would be a good idea to use cheesy pick up lines on a soul-devouring demoness? Iron Man: I try not to think before I do things. It takes all the fun out of it. Iron Man: Yeah, it's really funny how you pretended like you were going to stab me with a pitchfork and eat my soul. Loki: I've studied you Santana. You're an accomplished guitarist, but what makes you think you belong at Avengers Academy? Satana: I'm not looking for acceptance. I'm looking for my next meal. Loki: Yes, well, my soul is undoubtedly delectable, but know that I also excel at expelling demons. S.H.I.E.L.D. 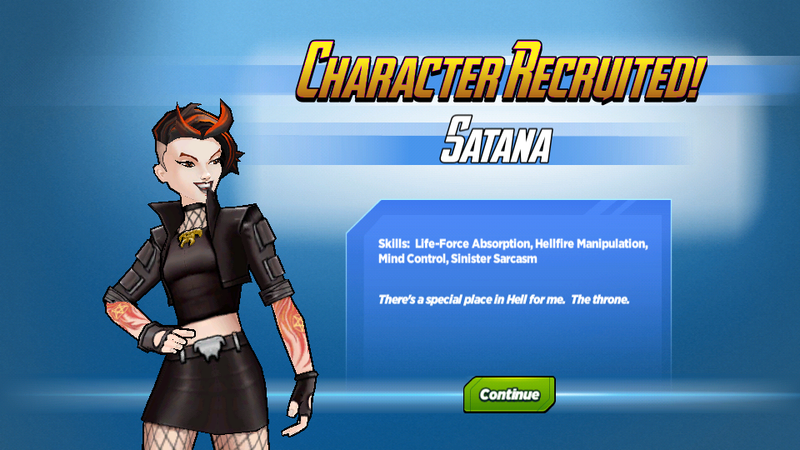 Recruit: Can I do anything else for you, Satana?! Satana: Not at the moment. I'll let you know when I need to use you as furniture. S.H.I.E.L.D. Recruit: Thanks! In the meantime, I'll hide behind this brick wall so no one has to look at me! Wasp: Hey Satana! I'm Wasp! If you try to eat my soul, I'll totally drag you back to Hell by your cheap tattoos! Wasp: Thanks! People usually say enthusiastic! Or terrifying! 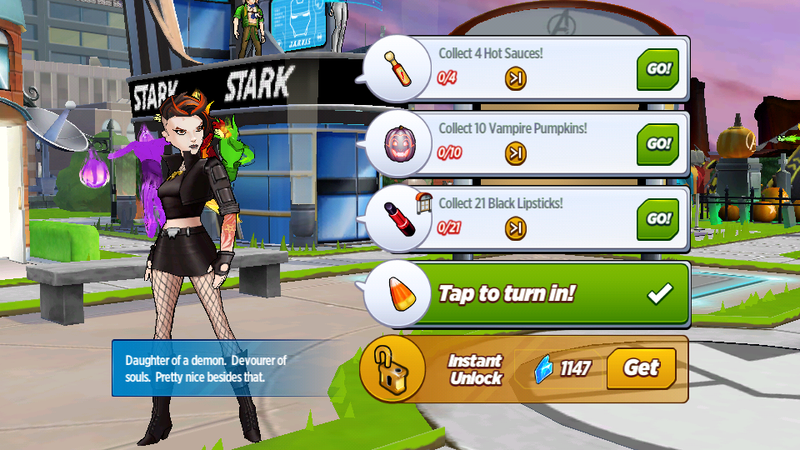 Satana: What do you do for fun, Wasp? Wasp: That was totally fun, but it's weird that you dance like everyone else. Satana: That's how we dance in Hell. Wasp: It all makes sense now! Satana: I've always been more of a Hellfire first, ask questions later girl, but I'll need a strategy to defeat Mephisto. Cap-Wolf: I'm good at strategy, but don't know anything about demons. You need an expert. Satana: There's a demon expert at Avengers Academy? What do you think of Satana? Have you managed to recruit her?